dacadoo health engagement solution launches today a completely redesigned user interface and many new features in its new mobile version of the dacadoo app for Android smartphones and the iPhone. 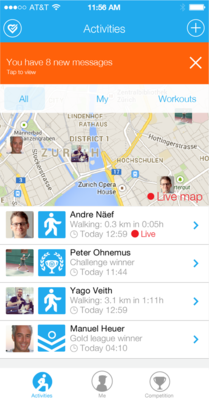 Zurich, Switzerland – The mobile and online dacadoo health engagement solution launches today a completely redesigned user interface and many new features in its new mobile version of the dacadoo app for Android smartphones and the iPhone. dacadoo offers a comprehensive health engagement and lifestyle navigation solution that enables individuals to track, manage and benchmark their health and well-being in an easy and fun way. Applying the principle of what you can measure you can manage, dacadoo visualizes the current health and well-being of an individual with a personal Health Score, a scientifically calculated number from 1 (low) to 1,000 (high). The score works as an indicator and moves up or down in real-time, depending on how the body values, emotional wellbeing, and activities (exercise, nutrition, stress and sleep) change. As more and more consumers want to access the dacadoo service from their mobile smartphones, dacadoo has worked intensively on offering more and more features from its award-winning website, also on the dacadoo mobile app for both Android smartphones and the iPhone. In parallel, it has completely redesigned its user interface of the app, so that the additional services can be integrated and accommodated in an attractive and natural way, fully aligned and embedded within the design guidelines of each native operating system (Android, iOS). dacadoo recently also launched a completely redesigned website – www.dacadoo.com - explaining the value of Health Score and its dacadoo Health Engagement solution much better to consumers, to employees for corporate health promotion activities and to other business partners. The dacadoo Health Engagement solution enables consumers to track, manage and benchmark their health and well-being in an easy and fun way. Based on the principle of “what you can measure, you can manage”, dacadoo visualizes the current health and well-being of an individual with a personal Health Score, a scientifically calculated number from 1 (low) to 1,000 (high). 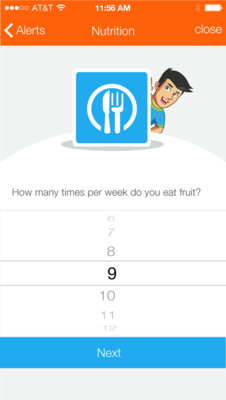 The score works as an indicator and moves up or down in real-time, depending on how the body values, emotional wellbeing, and activities (exercise, nutrition, stress and sleep) change. To be active and help individuals remain engaged, dacadoo applies motivation techniques from behavioral science and gaming, uses social dynamics from groups and social networks, and provides personalized feedback through its Health Navigator analytics engine. dacadoo works as health & lifestyle navigator in the pocket, motivates to stay active and keep going, rewards for success and helps to achieve goals. The award-winning company is working with strategic partners from the insurance, mobile telecommunications, health & wellness, and media industry sectors to bring this solution to the global mobile health market. dacadoo has offices in Zurich, Switzerland and in the Silicon Valley, USA.